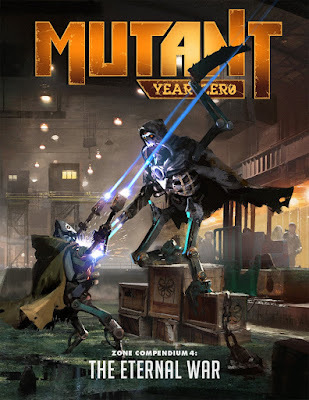 Mutant: Year Zero Zone Compendium 4: The Eternal War is the fourth supplement for Mutant: Year Zero – Roleplaying at the End of Days, the post-apocalypse set RPG based on Mutant - År Noll, the Swedish RPG from Free League Publishing released in English by Modiphius Entertainment. As with the previous supplements in this series—Mutant: Year Zero – Zone Compendium 1 – Lair of the Saurians, Mutant: Year Zero – Zone Compendium 2 – Dead Blue Sea, and Mutant: Year Zero Zone Compendium 3: Die, Meat-Eater, Die!—this is a slim supplement that presents various scenario set-ups and situations, or ‘Special Zone Sectors’—though not new rules—which can be quickly and easily dropped into a Game Master’s campaign and the sectors of her Zone map. Where those three supplements have in turn provided encounters in the Zone, at sea, and with the animals of Mutant: Year Zero: Genlab Alpha, this supplement provides encounters with robots, as detailed in Mutant: Year Zero – Mechatron – Rise of the Robots Roleplaying. As a supplement to a supplement—that is, a supplement to Mutant: Year Zero – Mechatron – Rise of the Robots Roleplaying—Mutant: Year Zero Zone Compendium 4: The Eternal War sets up encounters with robots in the wider world beyond the confines of Mechatron-7, a sub-sea manufacturing and supply base for Noatun, one of the three Titan powers which fought the apocalypse. Depending upon the scenario, this can be as player character mutants from the Ark in Mutant: Year Zero – Roleplaying at the End of Days or as robots from Mechatron-7 from Mutant: Year Zero – Mechatron – Rise of the Robots Roleplaying. Each scenario includes notes for using it with either and for what happens if there the mutated animals of Mutant: Year Zero: Genlab Alpha in the party also as well as the standard descriptions of the location, the situation, inhabitants, and possible events. The first of the four Special Zone Sectors is the eponymous, ‘The Eternal War’. The player characters—specifically mutants, but again easily adjusted to include other character types—find an intact building with an open steel door, near some water. Inside stairs lead down to an underwater harbour, complete with cargo submarines, cargo drones, a mystery, and two robots with conflicting orders battling it out to destroy each in between increasingly lengthy recharge periods. This a closed area, ripe for exploration, and an opportunity to send the player characters off in a radical new direct—perhaps to Mechatron-7, perhaps somewhere else of the Game Master’s design. (Oh, for an official scenario where that happened!) The facilities themselves could easily be expanded upon if the Game Master so wanted. Overall, this is a pleasingly straightforward Special Zone Sector to run with a limited number of NPCs and things going on. ‘Fort Robot’ the second scenario, can be best described as Mutant: Year Zero – Roleplaying at the End of Days and Mutant: Year Zero – Mechatron – Rise of the Robots Roleplaying get together and mix it up with West World. The player characters come across ‘WILD WEST WORLD’, a former theme park which has been taken over by robots who are slowly renovating it and restoring parts of it to order. As visitors they get taken in and invited to partake of what the park has to offer—drink at the saloon, ride the steam locomotive, visit the Native American village, and so on. Of course, the saloon gets shot up by bandits, the steam locomotive gets robbed by bandits, the Native American village gets raided by bandits—it is all part of the entertainment. This is all fun and good, but there is a rattlesnake or two present to shake things and how things shake out is definitely down to the players and their characters. In the meantime, both players and Game Master can have fun with the clichés of the Wild West genre in this inventive, if a little odd Special Zone Sector. The third Special Zone Sector is ‘Northbay Nandeep 23’ and is specifically designed to be played by player character robots. It can be run as part of the ‘Ghosts in the Machine’ from Mutant: Year Zero – Mechatron – Rise of the Robots Roleplaying and sees the player characters sent on a strange mission. They are given a Work Order to visit an external farming facility and ascertain what resources it holds. It turns out that the facility is still working—more or less—but not without its problems. Some robots want to keep it working, others want to leave, whilst still others are simply sick. All sides will be surprised to see the player characters, their arrival serving to upset the balance of power which has existed for a long while. There are a couple of secrets to uncover, but eventually things will come to head and chaos will probably break out at the facility. This is probably the most complex of the four Special Zone Sectors in Mutant: Year Zero Zone Compendium 4: The Eternal War. The last of the Special Zone Sectors in the supplement is the simplest and its only disappointing entry. ‘The Robot Factory’ is a restored cannery, a potential source of grub for the Zone that may well ensure the survival of its inhabitants. Unfortunately, the factory operators are employing slave labour—robot slave labour—and something of them are beginning to achieve self-awareness… Who will the player characters side with? The owners with their supply of canned grub or the newly awoken robots? Unfortunately there are not as many options or events to play this through as the other three Special Zone Sectors. Nor is there much in the way of subtlety or nuance either and it is rather underwhelming in comparison to the other three. It does not help that there is no internal map of the location either. Overall, not an overly special Special Zone Sector. Physically, Mutant: Year Zero Zone Compendium 4: The Eternal War is as well presented as the other titles in the series. The artwork is excellent and the maps, both illustrated and cartographic, are nicely done. In fact, the artwork also serves as great illustrations to show the players when they encounter the various locations and NPCs. The book is also well written, with solid descriptions and a handful of events and scenario ideas for the Game Master to flesh out. Mutant: Year Zero Zone Compendium 4: The Eternal War presents good collection of Special Zone Sectors. 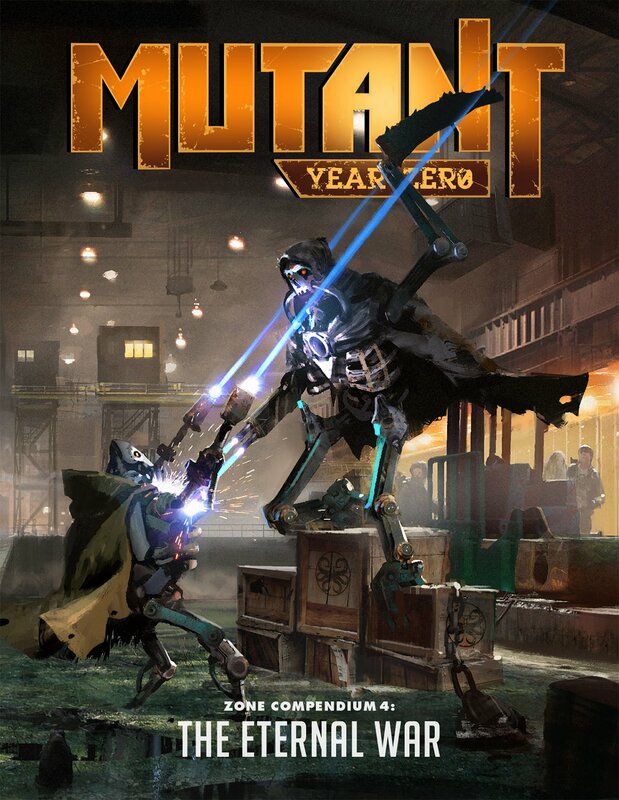 Three of them—‘The Eternal War’, ‘Fort Robot’, and ‘The Factory’—work as different introductions to the robots of Mutant: Year Zero – Mechatron – Rise of the Robots Roleplaying, in turn as killers, protectors, entertainers, and workers, whilst the third, ‘Northbay Nandeep 23’, introduces robots of Mechatron-7 to the outside world of the Zone. It would be good to see a supplement devoted to the Work Orders—the scenarios inside the robot facility, but Mutant: Year Zero Zone Compendium 4: The Eternal War is a nicely presented, solid set of Special Zone Sectors for when the Game Master wants to bring robot and mutant together for the first time. There has been a disappointing wait of a year between the publication of The Excellent Travelling Volume Issue No. 7 and the arrival of The Excellent Travelling Volume Issue No. 8, but not just in terms of the content for the content is not as promised. For on the back cover of The Excellent Travelling Volume Issue No. 7, the author and publisher promised the reader a complete ‘campaign starter’ which of course will be set in Sokátis, the location for the author’s House of Worms campaign. It would have included maps, locations, NPCs, adventures, pre-generated player characters, and more. When the ‘Just Off the Boat’ remains the roleplaying game’s default starting point, there remains the need for a starting point involving the player characters who are already Tsolyáni citizens and clan members rather than clanless, nakome scum. There was every chance that The Excellent Travelling Volume Issue No. 8 would provide such a starting point. Unfortunately, this is not something that The Excellent Travelling Volume Issue No. 8 provides. Now this is disappointing, but the author at least takes the time to explain why. The primary reason being because the author’s campaign has very much moved on from Sokátis, its starting base, and so he is focused on another region of TSR Inc.’s Empire of the PetalThrone: The World of Tékumel. Consequently, his attention has moved on and he is no longer as interested in writing about Sokátis, whereas he is interested in writing about the current state of his campaign. This understandable, but again disappointing. On the other hand, The Excellent Travelling Volume is the author’s fanzine rather than ours and he is well within his rights to write and direct the content as he sees fit. This of course, leaves the reader and the Tékumeli fanbase wanting the perfect campaign starter, the perfect step from rules into the rich setting of Empire of the Petal Throne: The World of Tékumel, but in the meantime, there is still The Excellent Travelling Volume Issue No. 8. 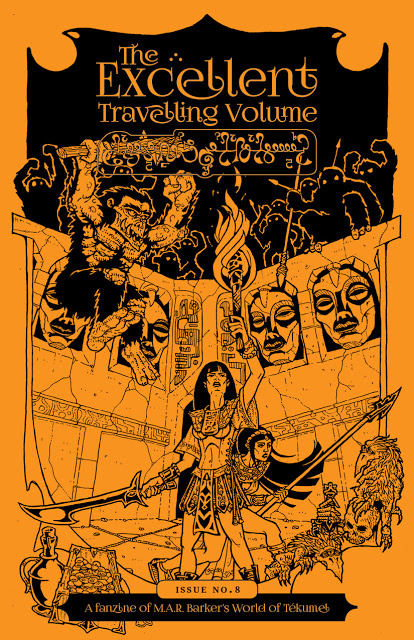 The Excellent Travelling Volume Issue No. 8 opens with ‘Linyaró, Outpost of the Petal Throne’, a small city located on the Achgé Peninsula. This describes how a few centuries ago an expedition lead by the temples of Ksárul and Vimúhla sailed south for some six months to the southern continent where they founded the city of Linyaró. Over the years, the city prospered and forged strong trade-relationships with the neighbouring Násqui city-states. More recently Prince Mridóbu has taken a strong interest in the colony and appointed a member of the House of Worms clan its governor. The clans important to the city are listed, as are the temples and various NPCs. What is interesting here is that the historical lack of interest in the colony by the high clans means that various medium clans dominate Linyaró and their hold various positions of power and influence. In effect, this gives player characters—certainly those of a medium status clan as found in many a campaign—the room to grow and gain authority and the Game Master to reward them as such. Even if the Game Master does not use Linyaró specifically, then she can at least use it as inspiration or a model for her own campaign on the frontier. The regular department, the ‘Bestiary’, adds four creatures native and non-native to the region, including the Cheshchá, essentially an ornery version of the Hmá; the vermin the Híkkutu; the Hlingá, a tiny lizard which can get into any box or crevice and is known for the slime it oozes which is painful to the touch; and the Rukétra, the large river beast with a rancid bite. None of these beasts are particularly aggressive and most amount to nuisances more than anything else. This points towards adventures in and around Linyaró rather than necessarily out on the frontier. Presumably, future issues of The Excellent Travelling Volume will describe new creatures and so support adventures beyond the confines of the colony. The setting is further supported a good map of Linyaró and a separate hex map of on the Achgé Peninsula, as well as by five patrons and a description of the region. The ‘Patrons’ column has been a persistently good feature in the fanzine and its inclusion in The Excellent Travelling Volume Issue No. 8 is no exception. They include a Shén mercenary looking for missing members of his company; a priest of Hnálla wanting aid and protection for a journey to a ruined temple; a local street urchin who fears for his life; the captain of the governor’s palace guard who fears that the palace has beset by a rash of thefts; and a merchant who might have an agenda other than just shipping goods. All are fully stated up and each of set-ups comes with several possible solutions ready for the Game Master to develop further. Perhaps it would have good to have included at least one patron who was native to the region, but otherwise this is a solid quintet. Accompanying this piece is a table of random encounters in the city. ‘The Achgé Peninsula’ explores the region beyond Linyaró in greater detail. It provides a history as known and a description of the region. More interesting though is the write-up of the native peoples and their culture—the Naqsái. There are some lovely details included about them, such as the fact that they wear parasols, loose clothing, and pigmented ointments painted in blocks on the skin to protect against the bright sun and high temperatures on the peninsula. As expected, attention is paid to their social structures, notably the lack of clans and the reliance on lodges, primarily professional bodies. Throughout the issue, there are illustrations of the Naqsái which although a little cartoon-like, have a slight Mesoamerican feel which do a terrific job of capturing the difference between Tsyolanu characters and the local inhabitants. Each is given a short description too, enabling the Game Master to develop them as NPCs. It would be interesting to see some guidelines in futures on creating and playing both Naqsái player characters and NPCs. Now as interesting as the material in The Excellent Travelling Volume Issue No. 8 on Linyaró, the Achgé Peninsula, and the Naqsái is, none of it is official. This is no surprise given how little official information there is on the region, but then it leaves it wide open for a Game Master—and in this case—author to develop their own information. This does not mean that the material here is any less interesting or gameable and so can be used by other Game Masters for their campaigns. 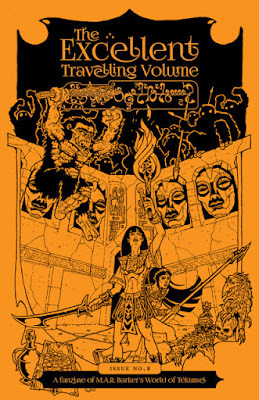 Physically, The Excellent Travelling Volume Issue No. 8 is up to the standards set by previous issues. The writing is engaging, the illustrations excellent, and it feels professional. Overall, The Excellent Travelling Volume Issue No. 8 might not be what was promised, but it continues to showcase the love that the author and his artists have for Empire of the Petal Throne: The World of Tékumel. The Grognard Files is a fanzine born of a podcast, The Grognard Files, a North of England podcast dedicated to the games of the late seventies and early eighties, in particular, RuneQuest. It is available only to patrons of the podcast—or alternatively to attendees of Grogmeet a one-day convention in Manchester, again in the North of England. It is also put out just once a year. Published by The Armchair Warriors, the The first issue, The Grognard Files – Annual 2017, is available as a ‘Pay What You Want’ PDF available to download with the proceeds of the sale of the fanzine will donated to continue the running of Yog-sothoth.com, the best site dedicated to Lovecraft and Lovecraftian investigative horror. Hopefully, The Armchair Warriors will do the same with The Grognard Files – Annual 2018, because it is a cracker of an issue—and not just because I have a review in its pages—with some good articles and a really fun scenario or two. As with The Grognard Files – Annual 2017, British gamers of a certain age will very much recognise the style and layout of White Dwarf from the mid-eighties which is used The Grognard Files – Annual 2018. It is applied to the adverts too, with those from Otherworld Miniatures, All Rolled Up, and The Shop on the Borderlands all echoing the adverts of the 1980s. All this is behind a great cover by Russ Nicholson, whose art graced the pages of many a Fighting Fantasy title and Warhammer Fantasy Roleplay supplement. So just from the look—as with The Grognard Files – Annual 2017—we are all ready for a heavy dose or two of nostalgia with The Grognard Files – Annual 2018. Like White Dwarf, the fanzine is divided into features and departments. The first of the departments is Open Box—named for the reviews department in White Dwarf—which presents four lengthy reviews, but opens them up from straight reviews to remembrances too. The four games are West End Games’ Paranoia, SkyRealms Publishing’s SkyRealms of Jorune (by guess who? ), Yaquinto’s Man, Myth, & Magic, and The World of Darkness. So the reviewers recall their experiences playing these games as much as they review them. Of the four, that of The World of Darkness feels slightly too broad and slightly out of kilter with the nostalgia with the rest of the fanzine. Overall, these are some nice look backs to both well remembered and little remembered roleplaying games. The nostalgia continues with the ‘Dissecting Worlds’ department. Here ‘Keharr’ presents ‘Pendragon: City of Legions’, which describes how he ran a Pendragon campaign not in its default setting of Salisbury and Logres, but in his home region—the Wirral. Little more than half a page long, this is a fascinating piece, shifting the game not just geographically away from the south of England, but also politically away from the support of Arthur. The result is a grimmer and more desperate campaign, played as a PBEM, and it would certainly be fascinating to read more about it. Perhaps some campaign notes will appear in a future issue of The Grognard Files. Michael Cule laments why as an aging gamer he cannot get excited about gaming any more in his column, ‘Cule’s Corner’. He also gets to reminisce how it has happened to him before, and just as before, appears to be mostly our fault given that we are not producing enough exciting games. The awful truth though, is that we might just end up like Mister Cule, so we need to get producing those games fast. ‘Fanscence’ gives Rob Knott room to reminisce about the gaming scene of the 1980s and his own fanzine, The Lankhmar Star Daily. As yet, there is no history of the gaming fanzine, but this adds a little towards such a history as well as a personal story that many readers of The Grognard Files – Annual 2018 will find familiar. The issue’s features begin with Justin Hill’s ‘At the Sign of the Dragon’s Tail’, a short story about aging adventurers coming to realise that discretion being the better part of valor. The issue’s biggest feature is undoubtedly ‘Better Living Through Chemistry’, a scenario written by Alan Gairey for the Judge Dredd: The Role-Playing Game published by Games Workshop in 1985. Set in the wake of the Apocalypse War, it sends the Judges—six pre-generated Judges are included—out on patrol before throwing them into a mystery involving illegal eating contests, the mob, chemistry, and more. As befits a scenario for Judge Dredd: The Role-Playing Game, it is thick with puns and jokes, plus of course, a good criminal mystery and lots of action. This is huge fun and hopefully the author will get to write more. The other scenario in The Grognard Files – Annual 2018 is Roger Coe’s ‘Diversion’. This is written for use versions of Call of Cthulhu written prior to Call of Cthulhu, Seventh Edition and explores what might happen if the investigators have to use a Gate or Gatebox and something goes wrong. In this instance, they find themselves all but naked and trapped in a strange alien technological complex. It is a nicely detailed ‘get out of that’ scenario, something very different for Call of Cthulhu, which presents an interesting situation that offers a change from the usual investigative fare. The Grognard Files – Annual 2018 takes on an international flavour with a contribution from Ken St. Andre, the designer of Tunnels & Trolls. In ‘On The Monster Races in RPGs’ he gives a history of the concept of playing monsters and the original roleplaying game to allow the playing of monsters, Monsters! Monsters! It is another slice of history, one that the author makes very clear predates the publication of Vampire: the Masquerade by some eleven years. It gets a bit silly with ‘The Grognard: a character class’ by Phil the Dice Mechanic. Designed for use with Dungeons & Dragons, Fifth Edition, characters of this Class are permanently middle-aged, use Rules Mastery to give others the Advantage, get Rules Mastery back with a nice cup of tea and a hobnob, and with Drone of Protection help others withstand the effects of fear or charm. This is a daft satire which the readers of The Grognard Files – Annual 2018 will probably recognise of themselves in. Lastly, The Grognard Files – Annual 2018 makes an odd switch from White Dwarf to Imagine, the magazine published by TSR, UK in the same period as the fanzine draws from, for a new and updated installment of Nic Novice. This cartoon strip ran in the pages of Imagine and from issue to issue it introduced the character of Nic to roleplaying and various different roleplaying games. In ‘Whatever Happened to Nic Novice’, Paul Cockburn and Wayne Peters relates how Nic has got old and stopped gaming when his granddaughter discovers his roleplaying books under the bed. It is as much a commentary on the differences between old gamer and young gamers, but it does highlight how there are young players coming into the hobby and that they are a diverse lot. Physically, The Grognard Files – Annual 2018 is well presented, well written, and comes with some excellent illustrations. Some of the other illustrations could have been better handled as they are somewhat fuzzy. Another issue is that a lot of the text is quite small and in places difficult to read. Especially that printed on darker backgrounds. This is probably an issue that affects a lot of the fanzine’s intended readership. Lots of nostalgia, a bit of silliness here and there, and a couple of good scenarios make for an entertaining and memory-provoking read. Hopefully, The Grognard Files – Annual 2019 will be just good, but in the meantime, one can only hope that The Armchair Warriors make The Grognard Files – Annual 2018 available to purchase because it is worth it for ‘Better Living Through Chemistry’ alone and everything else is icing on the cake. Echoes From Fomalhaut is a fanzine of a different stripe. Published and edited by Gabor Lux, it is a Hungarian fanzine which focuses on ‘Advanced’ fantasy roleplaying games, such as Advanced Dungeons & Dragons and Advanced Labyrinth. The inaugural issue, Echoes From Fomalhaut #01: Beware the Beekeeper!, published in March, 2018, presented a solid mix of dungeons, adventures, and various articles designed to present ‘good vanilla’, that is, standard fantasy, but with a heart. 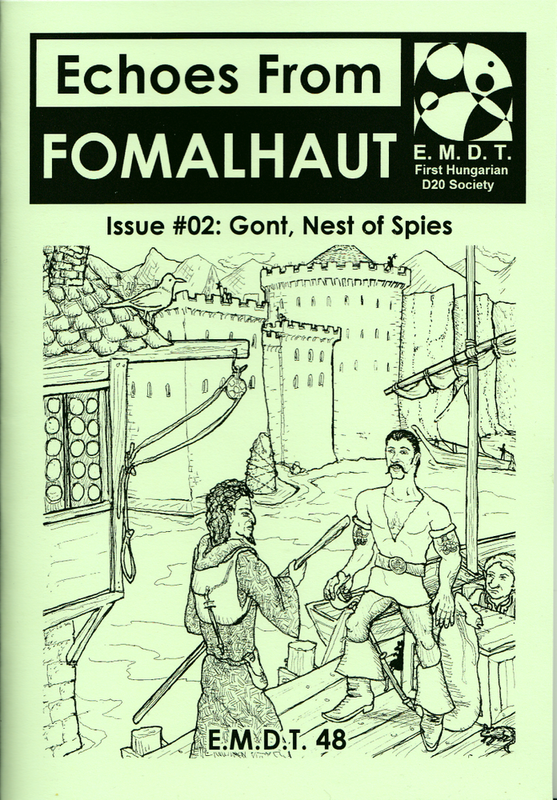 Published in August, 2018, the second issue, Echoes From Fomalhaut #02: Gont, Nest of Spies continues this trend with content mostly drawn from the publisher’s own campaign. It opens with Lazlo Feher’s ‘The Four Wives of Xantun’, a scenario outline for Levels two to four, set in and around Hlanith, a city state on the Cerenarian Sea in Lovecraft’s Dreamlands. The first of Xantun’s wives was famously lost to a shoggoth, whilst the other three are shades of her by way the murderous protoplasm. Although stats and descriptions are included, it is perhaps a bit generous to describe this as an outline. It is much more of a scenario set-up or seed which the Dungeon Master will need to develop further herself. The bulk of the fanzine though, is devoted to the island of Erillion and Gont, a port town on the island’s east coast. ‘A Guide to Erillion’ presents the island in some detail, placing the island kingdom between the Empire of Kassadia and the Confederacy. At its heart lies the Valley of Brazak Bragoth, guarded by the knights of Yolanthus Kar lest the Wraith Queen Arxenia and her court rises from their deep catacombs. This gives rise to the islanders’ practice of burying their dead in the valley, storing them in houses of the dead until this is possible. The last druids on the island were wiped out by Queen Arxenia some three centuries ago, so any on the island are recent arrivals; low magic is easily learned, but higher spells require wizards and illusionists to undertake a trial at the hidden Mage Tower and clerics are expected to undertake a quest by their deity. The gods commonly worshipped across the island are also detailed, although their descriptions do feel as if they could have included more detail. Although there are several other locations given in ‘A Guide to Erillion’, it is Gont that receives the most attention. The full description of the port is given in two parts—‘Gont, Nest of Spies’ and ‘Down the Smuggler’s Walk’. The first presents the town above ground, including some twenty or so locations and the town’s most notable inhabitants. These include Lord Gramatik, who rules in conjunction with the Captain’s Council, its members all loyal to him after his having sent their predecessors to the Chaining Stone on the harbour’s edge; the merchant Hadik Hurzol, intermediary to the Combination, the organisation which dominates criminal activities on the island; and Arkander the Enchanter and Drunken Peggy, whose tavern, The Sink, has a barroom the floor of which can be rotated to dump everyone into the sea or a fighting pit. The second explores what lies beneath Gont, a series of cellars, escape tunnels, and oubliettes. There are some forty locations to be found under the town, from empty reservoirs and abandoned cellars to fighting dens and the home of the leader of the Combination. Many of them have a relatively mundane use, which give the complex an interesting utilitarian feel. This sets up a nice contrast with the more fantastic and private of locations under the city. Together, ‘Gont, Nest of Spies’ and ‘Down the Smuggler’s Walk’ give a grimy, salt encrusted feel to the fishing port, everyone getting along with tensions just beneath the surface. Many of the locations described come with scenario hooks too, though some more would have been useful to get the player characters to the port and involved in its affairs. A lovely touch is the inclusion of a large double-sided map, one side of which has a hex-map of the island of Erillion and the other a blank map of Gont. Rounding out Echoes From Fomalhaut #02: Gont of Spies is ‘The Swine Lord’, a scenario of characters of Level Four to Level Six. The player characters are hired to do two things—one is to recover the debts of a veteran adventurer who has disappeared into the Highlands of Sibirk in the southern part of Erillion. The other is to find out what happened to the tracker who they already sent out and is yet to return. On one level the adventure is quite straightforward, a simple tale of debt collection, but there is a magical mystery here too. It is not an obvious mystery and the Dungeon Master may have to push and nudge her players to take an interest, but again, it serves as a nice contrast to the mundane nature of the party’s employment. It needs a sequel of sorts, especially if the mystery is solved. Overall, this is a solid adventure. Physically, Echoes From Fomalhaut #02: Gont, Nest of Spies is well presented with some very decent artwork in places. One or two of the lesser articles feel a bit cramped and out of place in comparison to the main pieces, which all are pretty good. The cartography in general is quirky and somewhat rough, but it is still legible and easy enough to use. 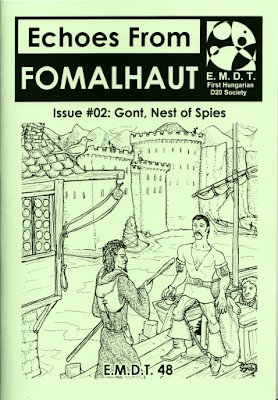 Echoes From Fomalhaut #02: Gont, Nest of Spies is certainly lives up to the author’s aim of it being designed to present ‘good vanilla’, that is, standard fantasy, but with a heart. It presents good material in the main, but it feels just slightly bland, as if there should be stronger hook or reason for a gamer to want to use that material. One such hook is that blandness itself, which allows the contents of the issue to shifted easily to a setting of the Dungeon Master’s own design. The other hooks are to be found deeper into the content of the issue, but they are local and the fanzine really needs to the hooks to visit both Erillion and Gont. Perhaps they can be included in the next issue of the fanzine, either as hooks or as a proper scenario. Overall, Echoes From Fomalhaut #02: Gont, Nest of Spies is decent enough, but it needs to find an identity for itself and its content to really grab people’s attention and for them to use said content. Megadungeon is a fanzine of a different stripe. Published by Hack & Slash Publishing, it is designed for use with Basic Dungeons & Dragons and Expert Dungeons & Dragons as well as Dungeons & Dragons, Fifth Edition. 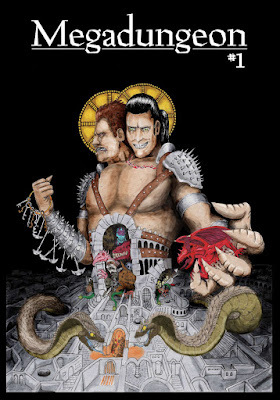 This marks it out as being unlike many other fanzines, but further, Megadungeon is different because it is devoted to the design and philosophy of the huge, expansive dungeons integral to some Dungeons & Dragons and Dungeons & Dragons-like settings. In particular, it is devoted to the author’s own megadungeon, Numenhalla. Fundamental to the design is the expansive nature of the megadungeon—it is not finite like dungeons such as Dwimmermount, Rappan Athuk, or Stonehell—and so Numenhalla is found everywhere beneath the Soma of the Gis, the author’s campaign world. In addition to extending everywhere under the world, Numenhalla is notable for four other features. First, it is not a deep dungeon, consisting of no more than four levels, so it is wide and shallow rather than short and deep. Second, there are multiple entry points into Numenhalla and a great many of these are known; likewise there are great number of secret routes and doors, lifts and stairs, portals, and more which enable its limitless halls and corridors to be more readily navigated. Third, the doors in and out open and close for limited amounts of time, so going in a party either needs to find another exit or wait for the entry it used to be open again. Four, megadungeon of Numenhalla is the campaign rather than the Soma of the Gis and that all of the action takes within its confines. This philosophy is stated in the opening pages of Megadungeon #1, published in December 2017, and continues with ‘Pillars of Megadungeon Play’, in which the play of a megadungeon is broken down into three activities—exploration, encounters, and extraction. Barring the middle of these three, the play is strategic rather than tactical with strong elements of resource management. It makes for slower play, with every decision intended to matter since making alliances, choosing which area to explore and raid, and what to take back with you, should all have consequences. This is supported by ‘Basic Megadungeon Play and Procedures’, which goes into more detail about movement, encounters, and obvious dungeons features like doors. It also presents the results of the Hazard Die—rolled instead of the old Encounter Die—such as an encounter, possible exhaustion, dungeon effects, monster signs, and so on, and explains each of these results. The specifics, rather than the philosophy of Numenhalla and the world of the Soma of the Gis really begin with the ‘Races of the Gis’. For the most these consist of the Races standard to Dungeons & Dragons, but with two interesting additions. One is the Gortha—surely a nod to Gort of The Day the Earth Stood Still fame, a race of thralls, empty of will and bereft of rights, used for labour and other services. They possess a high Charisma, but otherwise have average attributes. They cannot be selected as a Player Character Race though and act only upon instruction. The problem with this is, of course, whether or not the Dungeon Master and his players want to have what is essentially a slave race at their characters’ beck and call. Certainly it is not an aspect of the setting which anyone should necessarily be comfortable with, at least not without further explanation as to their existence. The other is the Augatics or ‘Chemical Men’, a race of immortal Golems given form by the gods and maintained by the Bindi (or Elves), though their repair skills are in decline. They are a tough race, capable of withstanding some damage and needing neither to sleep or eat. Of course, they need parts to be repaired rather than be healed. Augatics can install enhancements though into their eyes, head, torso, limbs and hands, and joints slots, such as Enhanced Perception Module, Thick Armor Plating Module, and Oiled Gears. These enhancements are expensive and so for Augatic characters, they will drive their need to loot Numenhalla. Weirdly, the ‘Augatic Class’ article does not follow the ‘Races of Gis’ which logically it should. For Basic Dungeons & Dragons and Expert Dungeons & Dragons, the fanzine provides a skills system with ‘Skills in Numenhalla’. Skills are rolled as single dice, a player rolling a six-sided die if his character is unskilled, a six-sided die if his character is skilled, and so on. The skills, which range from Agility/Athletics and Alchemy to Stealth and Stonelore, require the roll of a six to succeed at, so the more skilled a character is, the bigger a die a player get to roll. Secret doors, traps, doors, and so on use the same mechanics, which also replace the Thief Class mechanics. Intelligent characters get a skill (die) for each point of their intelligence bonus, whilst the Thief Class gets more and gets to train in them at every Level. Other characters have to pay to train and so the need to train will drive their need to loot Numenhalla. The ‘Gods of Numenhalla’ lists the deities worshipped in and above the megadungeon, an odd mixture of the Greek and Norse pantheons. Equally odd is their means of interaction with the mortal races—‘The Altars and Logos’. The former can be found throughout Numenhalla and are activated by religious rites and sacrifices to trigger a sort of fugue state from those involved awaken with little memory of. This is of course, one way of Clerics regaining their spells, but it can also be a means to access a parallel plane known as Logos by the power of the mind alone. Little description is given to the Logos and what might be found there, so hopefully this will be expanded upon in future issues. Just two sections of Numenhalla are detailed in Megadungeon #1 and they run to just three or four pages each. ‘Entrance Hall’ presents one way into Numenhalla and as an entry way into the megadungeon, it is actually not that interesting. This is no surprise given that previous parties of adventurers will have long stripped the area clean, but it makes for uninspiring adventuring, especially when no rooms or areas are detailed beyond the doors listed in ‘Entrance Hall’. Where it is interesting is in the presentation of the content, all but in bullet points, for a very digestible format. The same format is used for ‘Ettercop’, the second megadungeon location, the lair of a Spider Queen. It works much better because the location itself is interesting and comes with lots of lovely detail and flavour that the Dungeon Master can use to bring it to life for her players and their characters. That said, although the location is very much the better of the two, it is not very sophisticated and it is not very large. This does lend it though, to being easily pulled out of Numenhalla and dropped into the dungeon of the Dungeon Master’s own design. Both locations are mapped out on a single page with an almost three dimensional perspective. The maps themselves are really well done, but could have done without the rest of page being awash in grey which makes for a poor contrast and means that the actual dungeons are harder to read. Lastly, there are notes on the differences between Basic Dungeons & Dragons and Expert Dungeons & Dragons and Dungeons & Dragons, Fifth Edition in the context of the megadungeon. The author’s thesis is that Dungeons & Dragons, Fifth Edition is not designed for megadungeon play, but suggests how this should be addressed, adding back in gold for Experience, more detailed mechanics for encumbrance, and so on. Stats are given for the monsters in the ‘Ettercop’ location for both Basic Dungeons & Dragons and Expert Dungeons & Dragons and Dungeons & Dragons, Fifth Edition. Physically, Megadungeon #1 is cleanly and neatly presented. The writing is decent too, the content nicely balanced between the author’s ideas and actual details of the setting of his megadungeon. Despite its differences with a very great many of the fanzines, Megadungeon has something in common with another fanzine, Wormskin from Necrotic Gnome Productions and that it is a partwork. In other words, it is presenting its setting in discrete parts rather than in a logical flow. This would not be so bad were it not the fact that the same format is applied to the contents of this first issue. So that the description of the Augatics as a Player Character Race does not immediately follow the article on the ‘Races of Gis’ which logically it should. This pattern is repeated several times in the book so there is an odd randomness to content, which feels ultimately unnecessary. With Megadungeon #1, the author sets down his stall, laying the groundwork for a much greater and expansive project. Barring the inclusion of the Gortha, there is a lot to like here, even if its seemingly random organisation undermines its coherency. Future issues definitely need to be better arranged and definitely contain more of the dungeon locations, hopefully better and more sophisticated, but Megadungeon #1 is a decent start. One of the very first things released by Chaosium, Inc. for use with Call of Cthulhu, Seventh Edition was Alone Against the Flames: A Solo Adventure for the Call of Cthulhu 7th Ed. Quick-Start Rules. As the title suggests this is not an adventure designed to be played using the full rules from Call of Cthulhu, Seventh Edition, but those from the quick-start. The Call of Cthulhu 7th Edition Quick-Start Rules provide the essential rules to the roleplaying game and presents them in more of a digest form, along with one of the most famous of Lovecraftian investigative horror scenarios for—‘The Haunting’. They are certainly enough to play through ‘The Haunting’ and they are certainly enough to play through Alone Against the Flames. Thus Alone Against the Flames is designed as introduction to Call of Cthulhu, Seventh Edition, but one designed to be played alone—right from your very first steps into roleplaying. Set in the 1920s, Alone Against the Flames consists of some two-hundred-and-seventy separate entries across which the scenario’s plotlines and narrative are randomly distributed. Starting at the Introduction and paragraph one, the reader—or player—will wend his way through its plots and narrative, reading through a paragraph, following its instructions, and making a choice from the options presented at the end of each entry, skipping pages to the next paragraph, and so. Although the events of the scenario will play out as a narrative, with encounters being had, places being explored, clues being discovered, secrets being revealed, and shocks to the psyche being suffered the individual entries are not presented in narrative order. This will result in much flipping of pages back and forth as a narrative is played through, but it means that the scenario’s various storylines are kept hidden and thus it can be played more than once should a player want to discover all of the secrets in Alone Against the Flames. Alone Against the Flames begins, not with a player character or investigator, but with a journey. The protagonist in Alone Against the Flames is leaving his or her hometown and travelling to Arkham, Massachusetts where he or she is due to take up a new job or post. As the journey progresses, the rules interject into the reader’s progress to ask him questions and have him make decisions about his investigator. So that by the time the reader and his investigator has reached the village of Emberhead where the actual mystery in Alone Against the Flames is set, the reader will have determined what the values of his character’s attributes are, what his profession is,what his occupational skills are, and what his personal interest skills. It also provides an opportunity for the reader to roll some dice too. So although the process is narratively and mechanically linear, by the time the reader and investigator has reached the village, both are ready to investigate its secrets. The main story to Alone Against the Flames takes place in the isolated village of Emberhead. Here the investigator finds himself at a loose end as he awaits the next bus on towards Arkham. Although the inhabitants are more than accommodating, they also seem distracted with other matters and it is these distractions which will slowly come to concern the investigator as the story and his enquiries progress. The investigation itself is not overly complex—nor should it be given the introductory nature of the scenario—but it is against the clock. This places time constraints on the investigator and limits the number of lines of enquiry that he can follow. Again, this lends itself to returning and replaying through Alone Against the Flames as does the greater number of endings which result in the investigator’s death rather than his survival. Given its title, it should be no surprise that a great many of those fatal endings consist of a conflagration. Should the investigator survive, he will have learned just a little of the Mythos and the true nature of the cosmos, encountered a darker side of humanity, and in game terms, earned some skill checks. He is ready then, to encounter yet more of the Mythos, perhaps in a fuller scenario with other investigators roleplayed by other players. If not, the player is ready to try again, perhaps with the same investigator reset, or with another created using narrative path method written into the first entries in Alone Against the Flames. Physically, Alone Against the Flames is cleanly presented and unfussy throughout. Although lacking the colour and panache of Chaosium, Inc.’s later supplements for Call of Cthulhu, the solo adventure is both readable and accessible. There are no illustrations, but the layout is open enough so that each entry is discrete and easy to find. The rules are also nicely handled, only coming into play when necessary, whether that is investigator creation, rolling skills, or making a Sanity check. The story is equally as well written, nicely handling a growing sense of dread and tension as the reader and investigator progress through the scenario. Since its original publication, Alone Against the Flames has been adapted as the first part of the ‘Lovecraft Country’ campaign for Cthulhu Chronicles. That version is much simpler, but it retains much the same storyline and encounters. Further, Alone Against the Dark will appear in the forthcoming Call of Cthulhu Starter Box, along with ‘Paperchase’, the classic one-on-one scenario from The Cthulhu Companion which also appears in Cthulhu Chronicles. Veteran players of Call of Cthulhu will find Alone Against the Flames an easy scenario to play through as it is not too difficult and as fans of horror, will quickly be able to deduce what is going on in Emberhead. This does not mean that it is not challenging, and just like players new to Call of Cthulhu, they will probably find themselves replaying Alone Against the Flames more than once if their investigator is to survive. That said, whilst there is nothing to stop a player creating an investigator using the full rules in Call of Cthulhu, Seventh Edition and using that to play through Alone Against the Flames, the scenario really is aimed at players new to Call of Cthulhu. To that end, Chaosium, Inc. has made both Alone Against the Flames and Call of Cthulhu 7th Edition Quick-Start Rules to download here and here respectively. Plus, for the veteran Call of Cthulhu devotee there is a full campaign available, Alone Against the Dark. Alone Against the Flames: A Solo Adventure for the Call of Cthulhu 7th Ed. Quick-Start Rules is a solid introduction to playing Call of Cthulhu, Seventh Edition. It shows a player how to create an investigator and use the rules without ruining the tension and horror of the story, it showcases the mundane and the Mythos hand-in-hand, and it prepares a player—and hopefully his investigator—for the horrors to come in playing the many scenarios and campaigns available for Call of Cthulhu, Seventh Edition. It is a curious thing, but the latest iteration of the Legend of the Five Rings roleplaying game is as much a descendant of John Wick’s 1997 adaptation of the collectible card game as it is the Fantasy Flight Games boardgames, Descent and Doom. Of course, as soon as it was announced that Fantasy Flight Games was going to be publishing the new edition, we all knew that it would be a major redesign rather than a re-implementation of the mechanics seen in the First, Second, Third, and Fourth Editions and we all knew that it would eschew standard numerical polyhedral dice in favour of a proprietary design marked with symbols particular to the roleplaying game, not just in terms of its mechanics, but also as an intellectual property. After all, it is exactly what the publisher did with both Warhammer Fantasy Roleplay, Third Edition and all three iterations of its Star Wars roleplaying games— Star Wars: Edge of the Empire, Star Wars: Age of Rebellion, and Star Wars: Force and Destiny, as well as a Beginner Game for Star Wars: The Force Awakens. Thus, Legend of the Five Rings, Fifth Edition does use proprietary dice and it is a thorough redesign, but the setting remains very much the same, the five elements—or rings—have been more tightly integrated into the mechanics, and the core ‘Roll and Keep’ mechanic remains. The setting for Legend of the Five Rings, Fifth Edition is Rokugan. It is similar to feudal Japan, but with influences and elements of other Asian cultures, as well as magic and mythical beasts. Known as the Emerald Empire, it has been ruled for a thousand years by the Hantei emperors—the current emperor is Hantei XXXVIII—who have divided between seven Great Clans. These are the Crab, Crane, Dragon, Lion, Phoenix, Scorpion, and Unicorn clans. Although each is comprised of Samurai—the bushi warriors, mannered courtiers, and shugenja, priests who pray to the kami, or spirts, for aid, each is different in character. The Crab Clan use its strength to man the wall that protects the Empire from the Shadowlands, but its members are regarded as uncouth and ill mannered; Crane Clan is known as the Left Hand of the Emperor and has many wealthy and influential politicians; the Dragon Clan remains aloof from most affairs in its mountain fast, but has sallied forth to aid the empire several times; the Lion Clan is the Right Hand of the Emperor, being devoted bushi; the Phoenix Clan is known for its shugenja; the Scorpion Clan is the Emperor’s Underhand and revels in its villainous status and reputation; and lastly, the Unicorn Clan is Rokugan’s horsemen, having spent several centuries in the Gaijin lands to the West. Notably missing from this list is the Mantis clan, which was a Great Clan in some previous editions of the roleplaying game, but essentially, Legend of the Five Rings, Fifth Edition resets the timeline to before it was promoted from a minor to a Great Clan. As with the Star Wars roleplaying game, Fantasy Flight Games has released a starter set ahead of the core rulebook. This is the Legend of the Five Rings Roleplaying Beginner Game and like the Star Wars: Edge of the Empire – Beginner Game before it, it consists of a large box in which can be found several booklets, a map, a sheet of counters, and a bag of dice. These consist of a ‘Read This First’ booklet, an ‘Adventure Booklet’, four player character folios, a ‘Rulebook’, a map, and a sheet of full colour counters. These are presented in this very order as you pull them out of the box, though of course, being in that order, you really do wish that the box had a lid and you could take the contents out of the box, rather than having to pull them out of the top. Altogether, the Legend of the Five Rings Roleplaying Beginner Game is designed for several hours of play in the land of honour and steel by four players and the Game Master. Further characters are available to download, increasing the number of players up to seven, as is a sequel scenario set after the events of the scenario in the box. Everything in the Legend of the Five Rings Roleplaying Beginner Game is presented in full colour, on glossy paper, and feels professional—but then Fantasy Flight Games has done this before and you would expect nothing less than that. The starting point for is Legend of the Five Rings Roleplaying Beginner Game is the ‘Read This First’ booklet. Although it provides a quick introduction to roleplaying and an introduction to Rokugan which sets the scene for the ‘Adventure Book’, this primarily gives an example of play which showcases what the players and Game Master are going to be doing. The ‘Adventure Book’ is clearly marked ‘Read This Second’ and is the introductory point for the Game Master. It takes her step-by-step through what is in the box, how to run the game, and how the mechanics work, along with a little advice before going straight into the adventure itself. An experienced Game Master—especially if he is familiar with previous iterations of Legend of the Five Rings—could run this more or less out of the box, a read through of the ‘Adventure Book’ would probably be enough to run the given adventure. A less experienced Game Master is probably advised to read through it with a little more thoroughness and possibly read through the ‘Rulebook’ too. The adventure itself is ‘The Topaz Championship’. This of course, will be familiar to long time players of Legend of the Five Rings, a version of the scenario having first appeared the core rulebook for Legend of the Five Rings, First Edition back in 1997. The Topaz Championship is the most prestigious gempukku—coming of age—ceremony in Rokugan and the Great Clans send their brightest and best to compete, for to graduate following the competition brings great honour to both participants and their respective clans, let alone the honour and prestige which is bestowed upon the winner. As the scenario opens, four young samurai to be are making their way to the village of Tsuma in the Kakita Provinces of the Crane Clan where the Topaz Championship is held each year. The Emerald Empire is in turmoil, for the Emerald Champion, Doji Satsume of the Crane Clan, has died an untimely and mysterious death. The Great Clans eye each other with suspicion, wondering if the Emerald Champion’s death was more than an accident. Initially includes the player characters, but as events play out over the course of the three-day championship, they will learn to co-operate in the face of a mystery or two, some bullying ronin, and more, all the whilst competing against each other from one day to the next. Divided into eight scenes—with a break in the middle so that the players can upgrade their characters with some Experience Points—the scenario is designed to showcase as many elements of Rokugan, Rokugani society, and Legend of the Five Rings as is possible in those eight scenes. So there are interactions with the different levels of society, points of etiquette—such as gift giving, how to use skills, how to fight, encounters with the supernatural, a tea ceremony, good and bad manners, and more. It is quite a packed scenario, and that is before an experienced Game Master might want to add one or more of the suggested optional scenes (some of which will remind veteran players and Game Masters of previous iterations of this scenario). Overall, it is a good scenario and with the break in the middle should provide two solid sessions of gaming, perhaps more if the Game Master adds the extra scenes. Now if there is an issue with ‘The Topaz Championship’ it is perhaps that progress of both the player characters and their contestants could have been better tracked across the three days. Below the ‘Adventure Book’ there are four character folios. They consist of a Phoenix shugenga, a Lion bushi, a Dragon tattooed monk, and a Crane courtier. Behind the full colour character portrait on the front, each introduces the setting of Rokugan, some information about the character’s Great Clan and its attitude towards bushido, a full character sheet, an explanation of the core mechanics—including what dice to roll and what the symbols on the dice mean, and a second character sheet with room for the player to note the upgrades and additions at the scenario’s half time. The character’s background is on the back of the folio along with a list of suggestions as to why a player might want to choose that character. All four character folios cover a lot of information, but it is neatly organised and easy to read. Looking at the character sheet, there is much that will be familiar to veteran players of Legend of the Five Rings. Each character has five rings—Air, Earth, Fire, Water, and Void. These are his core attributes. He possesses various skills, which have been categorised into Artisan, Martial, Scholar, Social, and Trade sections. A character’s progress can be tracked by the familiar Honour and Glory stats, whilst Endurance represents stamina and willingness to fight and Composure is a character’s capacity to endure mental and emotional pressure. Attached to Composure is a character’s ‘Personal Marking’, essentially his reaction after having suffered to much stress—or in game terms, ‘Strife’. For example, when Strife exceeds the courtier’s Composure, she will break down into unseemly weeping. Another new stat is Vigilance, which represents a character’s awareness and perception and replaces the Awareness and Perception stats of the previous editions as well as the Investigation skill. Each character also has some equipment, an advantage which typically allows two dice to be rerolled when it comes into play, a school ability—a special ability learned as part of his training, and a note of his personal turmoil. The latter is primarily for roleplaying purposes. Also noted are the ‘Approaches’ a character can take and the type and number of dice the player rolls for each. Legend of the Five Rings Roleplaying, Fifth Edition and thus the Legend of the Five Rings Roleplaying Beginner Game uses two types of dice. One type is the six-sided, black Ring dice, the other is the twelve-sided, white Skill dice. Both are marked with a mix of four symbols. These symbols are ‘Success’, which indicates a character’s effective at an action or skill; ‘Explosive Success’, which counts as a ‘Success’ and enables another die of that type to be rolled if the ‘Explosive Success’ has been kept; ‘Opportunity’, which provides positive, incidental benefits; and ‘Strife’, which are primarily negative effects on a character’s emotions. Where Strife can be accumulated until a character suffers an unmasking and shows his inner emotional turmoil, Opportunity can spent to remove Strife, to spot a particular detail, to perform the task in a pleasing fashion, inflict a critical strike in combat, and so on. Five dice of each type are included in Legend of the Five Rings Roleplaying Beginner Game. To undertake an action, a character has to do three things. The first action is to set an Approach—or ‘Stance’ in combat—but which one is determined by a character’s Rings. An Air Approach is graceful, cunning, and precise; an Earth Approach is steady, grounded, and thorough; a Fire Approach is direct, ferocious, and inventive; a Water Approach is balanced, flexible, and perceptible; and a Void Approach is enlightened, centred, and mystical. Each Approach indicates the Ring to use as well as provide certain advantages with conflict Stances. Further, in the scenario, ‘The Topaz Championship’ has scenes where certain Approaches are favoured by various NPCs. The Ring also determines the number of dice to be kept after rolling. The second action is to select the skill. For the most part, the combination of the Ring and Skill will obvious and this is listed for each skill in the ‘Rulebook’, but there is an intentional flexibility here too as there are benefits to taking different Approaches to the various skills. The third action is for the player to roll the dice and decide which to keep—preferably those with the most Successes and Opportunities. If the number of Successes exceeds the Target Number, two being an average Target Number, then the character has succeeded. After that, the player spends any Opportunities rolled and totals up any Strife rolled. For example, Akodo Chinatsu is on guard duty at a border crossing when she is attacked by a bandit. First, her player has to roll her initiative. This is a Target Number 2 Tactics check. Chinatsu has Tactics 1, so her player will be rolling one Skill die. Her player decides on Chinatsu’s Earth Ring of 3 as her Approach—steady, grounded, and thorough. He will be rolling three Ring dice and one Skill die, keeping three. He rolls two Successes and two Opportunities. He succeeds and ensures that the bandit cannot use Opportunities against Chinatsu and spends the Opportunities he rolls to inflict Strife on the bandit. The bandit attacks, but because Chinatsu’s player rolled more Successes, Chinatsu gets to strike first. Her player continues to use her Earth of 3 as her Approach and combines it with her Martial Arts (Melee) skill of 2. He will roll three Ring dice and two Skill dice, keeping three of them. He rolls two ‘Successes’, an ‘Opportunity’ and a ‘Strife’, and an ‘Explosive Success’ and a ‘Strife’ twice—some faces of the dice have two symbols rather than one. Of these, he must keep three. This will be the two ‘Explosive Success’ and a ‘Strife’ result and one of the ‘Success’ results. He rerolls the ‘Explosive Success’ results to add one more ‘Success’ and a ‘Success’ and a ‘Strife’. The results are as follows: five ‘Successes’ and three ‘Strife’. This is increased to six ‘Successes’ and decreased to two ‘Strife’ by Chinatsu’s School Ability of ‘Way of the Lion’. The ‘Strife’ is recorded, Chinatsu concerned that she might fail in her first combat. The Target Number for the Martial Arts check is 2, so Chinatsu has succeeded and still have four Successes left over. These her player decides to apply to the damage Chinasu’s katana inflicts, which is four—so the bandit suffers eight damage and is not looking very healthy. In general the rules have shifted towards a narrative style of play whilst retaining many of the elements intrinsic to the mechanics of previous versions of Legend of the Five Rings. Fortunately, they appear not to be a complex as those found in Star Wars: Edge of Empire et al or indeed, Warhammer Fantasy Roleplay, Third Edition. The Rings, especially with the use of the Approaches feel better integrated into the game and are likely to offer some interesting nuances and wrinkles which will become apparent with play. The last book in the Legend of the Five Rings Roleplaying Beginner Game is the ‘Rulebook’ and is marked ‘Read This Last’. The longest book in the box, this explains the rules, covering the rules and the elements of the character in more detail. It also details skills, equipment, and various NPCs and threats, both mundane and supernatural. This provides enough of an explanation and enough content certainly to play through ‘The Topaz Championship’ and its sequel. The last two items in the Legend of the Five Rings Roleplaying Beginner Game is a map sheet and a set of counters for use on the map. The map is double-sided. On the one side is an A3 map of Rokugan, which is attractive if not necessarily all that detailed, whilst on the other are maps of Tsuma, where ‘The Topaz Championship’ takes place and of the ‘Castle of the Emerald Champion’, where the sequel scenario takes place. These are much more detailed, the castle in particular done in almost isometric cutaway fashion. All three maps are done in muted colours and have a suitably period feel to them. 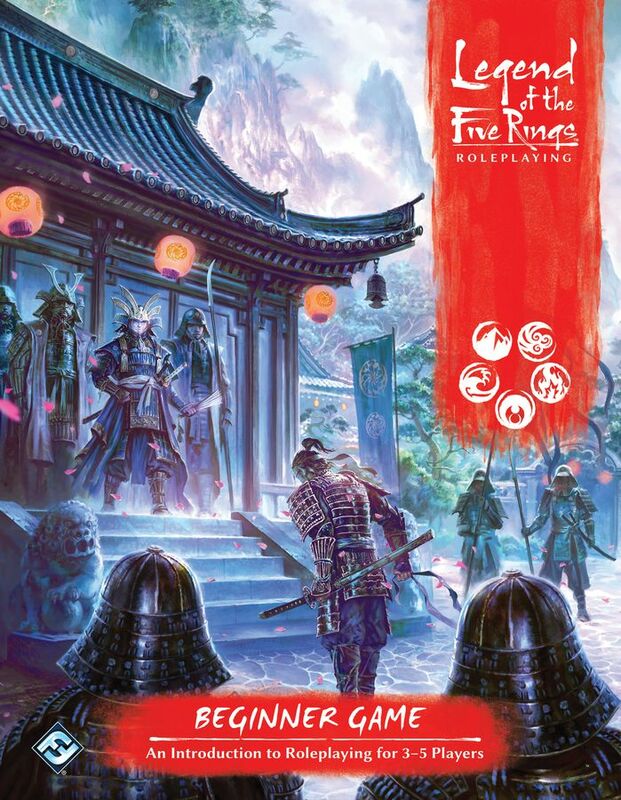 Fantasy Flight Games has plenty of experience when it comes to designing this type of starter box and so the Legend of the Five Rings Roleplaying Beginner Game feels professional and well put together. Now on one level, with just ‘The Topaz Championship’ to be found inside its box, it does not feel as if there is a great deal of play value to be got out of just the Legend of the Five Rings Roleplaying Beginner Game—just two or three sessions. That though is not really fair as the sequel provides several more sessions of play and anyway, the Legend of the Five Rings Roleplaying Beginner Game is only designed to provide an introduction to Rokugan and its roleplaying game. Which it does very well—and more, given that it comes with the proprietary dice, the character folios, the maps and counters, which are not only attractive, but which can also be used with the Legend of the Five Rings Roleplaying, Fifth Edition core rules. Overall, the Legend of the Five Rings Roleplaying Beginner Game is nicely put together package, which deftly introduces the setting of Rokugan and showcases the rules for new players, whilst deftly showcasing what is different with the rules for veterans as well as allowing them to replay ‘The Topaz Championship’ once again. Mars—and the colonisation of Mars—has been the theme du jour for board games of late, with Terraforming Mars from Stronghold Games being premier treatment of said theme. It is a big game and has a playing time of two or more hours, so bringing it to the table can be a challenge in itself, let alone learning and teaching to play it. So for some groups, a shorter, simpler treatment of the theme might be more accessible. Pocket Mars is such a treatment, a ‘heavy weight filler’ from Polish publisher, Board & Dice, designed for two to four players, aged ten plus, and to be played in fifteen to thirty minutes. The card game combines area control, area influence, and hand management mechanics with pleasing components and constant player choice. The aim in Project Mars is to get as many of your colonists from Earth to Mars via your Spaceship and occupy as many of the Buildings there. This is done by playing Project cards—either as snap or prepared actions—to move your colonists and manipulate your level of energy. The game ends on the round in which a player has managed to get all seven of his colonists to Mars at which point, the player with the most Victory Points is the winner. Pocket Mars consists of forty-nine cards, twenty-eight colonist markers, four energy markers, and a rulebook. The latter is well written, does a good job of explaining the game and includes a number of play examples. The energy markers are used to track each player’s energy on their spaceship and the colonists are divided in four, giving each player seven colonists. The cards are divided into five Building cards, four amusingly named Spaceships and four Reference cards, and thirty-five Project cards. Four of the Building cards—Water (blue), Ecosystem (green), Science (maroon), and Energy (orange). Each has a starting Value, equal to three, and two spaces for colonists. One space can hold unlimited numbers of colonists, whilst the other can only hold limited numbers. Each colonist in the first space is worth two Victory Points at the end of the game, whilst each colonist in the second is worth four Victory Points. The fifth Building, Construction (black), has no spaces for colonists. All five Buildings have special actions. For example, the special action for Ecosystem (green) allows a colonist to be moved from space to another on any Building card. The colonist can belong to any player, so it can be used to benefit a player or hinder an opponent. These special actions are triggered when a Project card with a greater value than the Building value is played on it under certain circumstances. The Project cards are divided in five suits of seven cards each, their colours corresponding to the Building cards. All of the cards have a value. This is zero for the Construction suit, but the numbers for each suit run from one through seven. Each Project card has two actions—the upper one for when it is played from a player’s hand and the lower one for when it is played from his Prep Module. For example, the six Project card for Ecosystem (green) enables a player to move a colonist between spaces in the Building of his choice and grants him four Energy. If played from the Prep Module, a player can move one colonist from his Ship to a Building of his choice. At the start of the game, each player has one colonist on his Ship and one Energy. He receives four Project cards. Two of these are kept in his hand, but two are placed face down in his Prep Module. Each player always has four Project cards—two in his hand and two in his Prep Module. On his turn, a player can take one action from a choice of five. He can play a Project card from his hand, play a Project card from his Prep Module, play a Project card from another player’s Prep Module, take one colonist from Earth and put it aboard his Spaceship, or discard a Project card—from either his hand or Prep Module to gain one Energy. When playing a Project card from his hand, the card is discarded. When playing a Project card from his Prep Module, it is placed underneath the corresponding Building and can trigger both the Project card’s lower action and the Building’s special action. If the value of the Project card is higher than the value of the Building or the current Project card on it, the player can also place a colonist on the Building card. When playing a Project card from a rival player’s Prep Module—this is drawn blind, although a player will know which suit the Project card comes from—it is placed underneath the corresponding Building as normal. This activates the lower action for the player whose Prep Module the Project card is taken from, but allows the player who played the card to trigger the Building’s special action. Play continues until a round ends with one player having transported all seven of his colonists to Mars. Then each player totals his Victory Points. These are earned for each colonist he has aboard his Spaceship, each colonist he has in a Building—each space has differing Victory Points, for having colonists in all four Buildings, and for having four colonists in a single Building. Another Victory Point is earned for having the most Energy at game end. Colonists on Earth are worth no points. Physically, Pocket Mars is nicely designed. A lot of thought has been put into making both the rulebook and the cards clear and easy to understand. The artwork is good, but perhaps a bit bland on the Project cards, showing just blueprints. It does not help that these are unnamed, so it never feels as if you are building an actual thing rather just an anonymous upgrade. This means that the game feels rather abstract in play. Nor does it help that none of the Building cards are named—at least on the cards, as they are named in the rulebook. There is an element of card counting in the game’s play. Because the Project cards for all Buildings bar those for the Construction Building, are numbered from one to seven, players can track them as they enter play, so that as they are put down on Building cards, the range of numbers available decreases and a player can attempt to work out where each Project card is. On the downside, all of this decision making can lead to analysis paralysis, which is compounded by the fact that a player can find one of his Project cards in his Prep Module being used by a rival player and thus suddenly find himself having to decide which Project card to replace the just used one. This is in addition to the somewhat abstract nature of the design—the Building and the Project cards, in particular—and perhaps a lack of variety in the play to support multiple replays. The number of choices Pocket Mars presents the players with certainly mark it out as a ‘heavy weight filler’. Surprisingly, the depth and range of choices is not quite managed by the theme, which feels somewhat light. 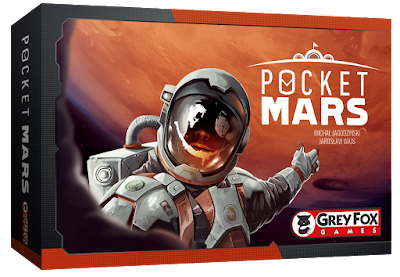 Overall, Pocket Mars is a tightly designed game which offers choice, but not quite enough variety. The number of choices means it is slightly heavy for casual players and the lack of variety means that it does not offer enough replay value for more dedicated players.